The Ultimate Massage Table Accessory Package features carefully selected premium products to provide your client with the ultimate in comfort. With this package, you can turn an ordinary massage table into an extraordinary one. From cotton flannel sheets and a heated fleece warming pad to our fully adjustable QuickLock™ face rest with Boiance face rest pad and our Arm Hammock, this package we focused on ultimate client comfort. And we didn't forget you either. The premium swivel stool allows you to sit in comfort while you work. The Professional carry case keeps your massage table protected and makes transporting your portable table, bolster, face rest and sheet set much easier. When purchasing this product, we recommend selecting the next largest size package for portable massage tables with AeroCel padding. FREE Shipping on this massage table accessory package. This Portable Massage Table accessory package include free shipping on the items in this package when ordered with one of our portable massage tables. This offer is limited to the 48 contiguous United States. Alaska and Hawaii customers may contact us for shipping charges to your location. Boiance Face Rest Crescent - This face cradle pillow was designed and engineered by LMT Patricia Binder. Using her experience and expertise in the field of massage therapy, Patricia has used that knowledge to build the face cradle pillow your clients will love. 8" Fluffy Bolster - Oakworks 8" Fluffy Bolster is super soft and provides the ultimate in cradling support for the hips, knees and ankles. 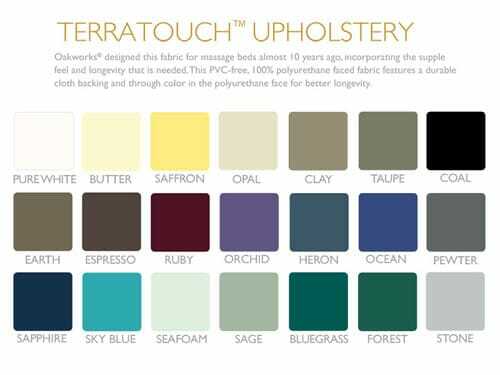 Filled with ultra-soft material and covered with earth friendly PVC free TerraTouch fabric, the Oakworks 8" inch Fluffy Bolster is the perfect positioning tool. Premium Heated Fleece - This luxurious fleece Table Warmer can fit almost any table and distributes heat evenly while enveloping your clients in plush comfort. The digital hand control features continuous, real time temperature read out with a programmable, auto shut-off feature of up to 99 minutes. Premium Swivel Stool - Oakworks Premium Stool is durable and comfortable with simple pneumatic height adjustments, 3" high density multi-layer padding, a bump protector edge and 5 star base with casters. This stool has a height range from 18 - 24 inches. ► Dimensions: 29" x 71" x 1"
► Pneumatic Height Range: 18" - 24"
► Weight Capacity: 300 lb.